“Pam, international travel is really hard work and exhausting,” said my Dad. At that point, I had only seen pretty postcards of Europe which made it look like heaven on earth to me. My Dad was a World War II veteran and fought in Germany the last few weeks of the war, and then was stationed in Austria until 1946. He had been back to Europe on business trips numerous times. “How difficult can it be to get on a plane and go see pretty places?” I thought to myself. I would find out my Dad was right! I spoke a fair amount of German since I studied it in high school and college and I was eager to try it out in Austria and Germany. French was another matter, as it was never my strong point. I dropped it after one year of it in the ninth grade. I researched the flights and found a charter flight from the Midwest to Frankfurt for $389. This was a lot of money for me considering my monthly take-home pay as a new graduate nurse was less than $1000. I bought a 21 day Eurail pass for $220 which would take me on the train or boat anywhere in Europe. I studied Frommer’s travel book called “Europe on $10 a Day” until I had it practically memorized. I carefully tore out the sections on Germany, Austria, and France where I would be visiting to cut down on the weight of the large paperback. Traveling light to Europe for three weeks. He said only take three conservative clothing outfits, a small bottle of Woolite soap, and a ten-foot clothesline to put up in your room every night, so that’s what I did. I bought a new pair of walking shoes 3 months before and broke them in just like he said. I had a German and French phrase book. I was traveling alone for 3 weeks to see what it was like as I was asking the Lord if I should go to Germany to work with a local church. I was visiting missionaries in Austria and France, and the cousin of a friend in Germany. In between visits, I would be on my own. I don’t have time to give all the details, but it was the trip of a lifetime. My Dad was right. It was exhausting and hard work. It’s hard to read the signs at the train station and a boat dock in a foreign language, avoid being accosted by drunken high school students, find a hostel to stay in at night. It was also difficult to work the pay telephone and figure out the correct coin to use and change my money as I entered a new country. But the blessings were innumerable as I asked the Lord to guide and protect me every day. 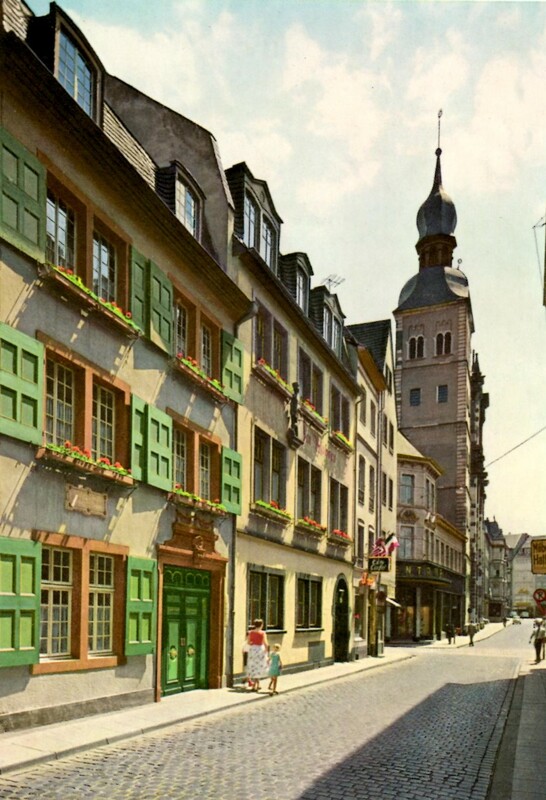 I had wonderful opportunities to meet dear believers, share the gospel with others, experience God’s wonderful protection, see the starlit skies at night in the majestic Alps, enjoy a concert in Mozart’s house in Salzburg, visit Beethoven’s house in Bonn, and take a boat ride on the Rhein River. 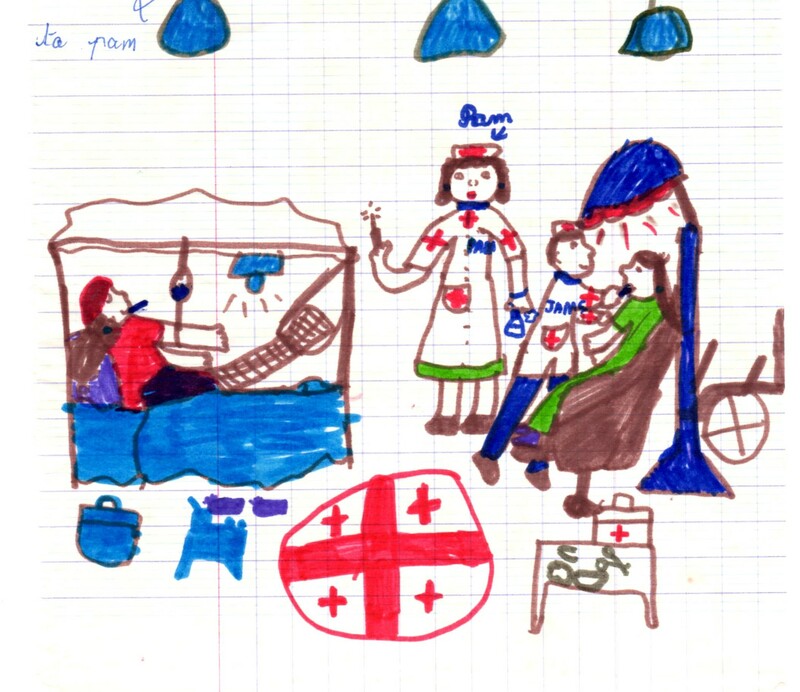 French girl’s drawing of me as a nurse-my favorite souvenir! I realized that there are poor people in Europe just like in the States, and everything doesn’t look like a postcard. You have to pay to use the restroom. You can’t drink the tap water, but have to buy bottled water. There are no drinking fountains. The bathtub is down the hallway a floor below and you have to pay to use it. There is no washcloth or hand towel in the hotel room. They charge you for each refill of your coffee cup. The cobblestones wore out my walking shoes in 3 weeks. Some of the people were friendly. Some weren’t. One woman shouted at me derisively in German, “American, Go HOME!” late at night as I walked down the street. Was I glad I went? Absolutely! God taught me so much about Himself and was so precious to me in the times of loneliness. But I decided after that trip that I could not be very effective alone in Germany, so remained in the Midwest. Since that first trip abroad, God has allowed me to visit 21 more countries over the years. I treasure the friends I have made all over the world, missionaries I have met, and opportunities I have had to share the gospel in so many places. 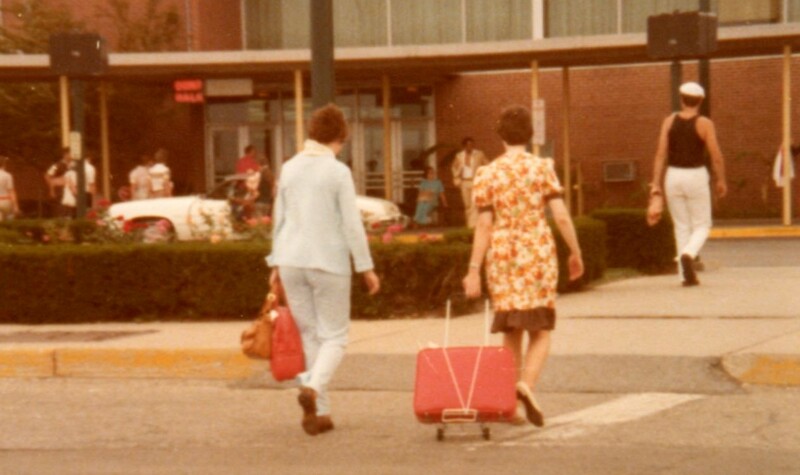 After September 11, 2001, air travel security changed dramatically which is cumbersome. As soon as the Lord leads me to visit a country, I learn as much of the language as possible. I read the history, learn the customs, and research different blogs of people who live there. I always try to find a local church to worship at on Sundays. I have taken tours to China, Israel, and Costa Rica. Because I find the long flights so exhausting, I arrive the day before the tour starts to give me a day to recover and adjust to the new time zone. In 1978, I arrived home from Europe at 1 a.m. and went to work at the hospital at 3 p.m.! I barely made it through that busy shift on the medical-surgical unit. I learned from that experience to schedule a few days at home to recover before returning to work. To strengthen my gastrointestinal tract and immune system, I take a daily probiotic (such as Align). I would suggest starting it a month before your trip. Since I began doing this, I haven’t caught a cold or had traveler’s diarrhea. When eating fruits and vegetables, the rule is “Wash it, peel it, cook it, or forget it!” Avoid lettuce, ice, and ice cream also. Carry tissues and hand gel as many countries don’t have toilet paper or soap in the “free” restrooms. If malaria is present, check out the most recent guidelines at http://www.cdc.gov Some of the medications to prevent it need to be started 2 weeks before you leave. I think this is enough for this week! Next week I will give you my packing tips.